A modern approach to payroll accounting, Payroll 2019 provides a “practitioners’ view” of this highly specialized area of accounting. 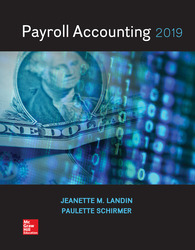 Payroll 2019 incorporates examples of real-world companies, and highlights the relevance of the course in its coverage of issues that students will face in their careers. Connect: A highly reliable, easy-to-use homework and learning management solution that embeds learning science and adaptive tools to improve student results.